Yesterday I talked about the Fermi gamma ray telescope, and how it allowed us to make much more precise observations of gamma rays in the universe. Part of the purpose of the Fermi telescope is to observe gamma ray bursts, but its broader purpose is to make a sky survey of gamma ray sources in the universe. Already it has found something quite interesting. 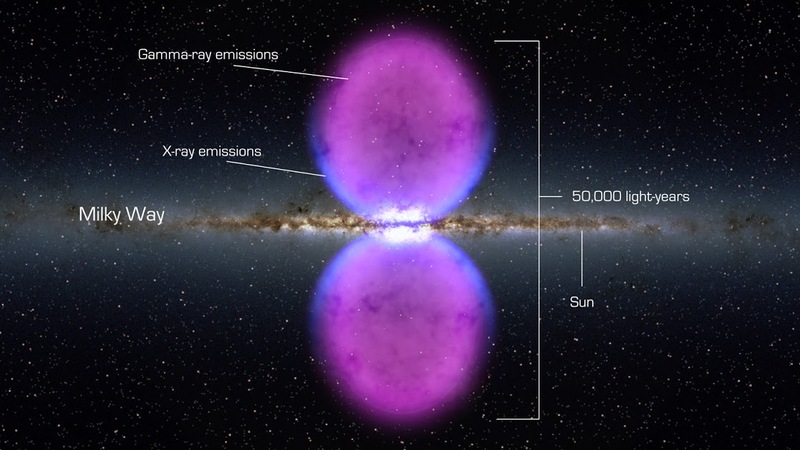 The image above shows the plane of the Milky Way with x-rays indicated in blue and gamma rays indicated in purple. The x-ray regions had been observed earlier by the ROSAT satellite, but it took FGST (Fermi Gamma-ray Space Telescope) to observe the gamma rays. Neither the x-ray nor gamma ray sources are particularly bright. Instead they come from a diffuse region producing these rays. What’s particularly striking about these “bubbles” is that that are quite large. The regions span 25,000 light years in either direction of the central region of our galaxy. It is so large that it spans more than half the sky. It is caused by a process known as inverse Compton scattering. Electrons moving at speeds near the speed of light collide with low energy (radio or infrared) photons, giving them a massive energy boost and making them gamma rays. The large size of these bubbles means that they were caused by a large process. They also seem to have a clearly defined boundary. Given that they are caused by electrons moving at nearly the speed of light, and the fact that they extend about 25,000 light years out from galactic center, a likely cause would seem to be from jets emanating from the supermassive black hole in the center of our galaxy. Currently the black hole doesn’t seem to be producing jets, but the bubbles could be evidence of past activity. Last year new evidence hinted at even more interesting effects. A study published in the Journal for Cosmology and Astroparticle Physics has proposed that some of the gamma rays in the bubbles could be produced by the decay of dark matter in the galaxy. The paper looks at the energy distribution of gamma rays near the galactic plane, and seems to find a spike of gamma rays at an energy of 130 GeV. Such a spike could be evidence of dark matter, but the research looked at such a narrow energy band that the data set consists of only 50 gamma ray photons. Even the author of the paper says this result should be considered very tentative. Gamma ray astrophysics is still a relatively new field of study, but it is quickly providing us with new results and new mysteries to ponder.